Odom’s group is also pursuing new applications of this class of materials and is among the first to examine organic compounds for a new type of flow battery that contains non-aqueous (meaning “not water”) electrolytes, that have applications in large-scale stationary storage systems. For these applications, it is important to enable increased utilization of fluctuating renewable energy sources such as solar and wind power. Odom was an undergraduate researcher at UK. Her work, under the mentorship of Professor of Chemistry John Anthony, resulted in the design and synthesis of materials that have been licensed through a patent that enabled analysis of these materials in field effect transistors. “It's a long-term, fulfilling experience to think that I've invented something that's important enough for someone else to invest in financially,” Odom said. 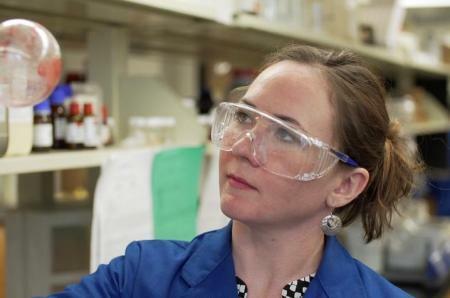 After earning a doctoral degree from Georgia Institute of Technology in 2008, Odom worked as a postdoctoral fellow at the University of Illinois at Urbana-Champaign during which she secured a joint appointment at Argonne National Laboratory as a visiting scientist. She was drawn to return to UK because of the variety of research being conducted in the College of Arts and Sciences, College of Engineering and Center for Applied Energy Research (CAER). A background in organic chemistry and an interest in applied research has enabled Odom to work with engineers at Oak Ridge National Laboratory and Massachusetts Institute of Technology to bring outside expertise in projects involving flow battery research. Odom also collaborates with Anthony, her former undergraduate mentor, to develop electrode materials in flow battery research, uniting the pair once again in a new research project. Odom has published numerous times in peer-reviewed publications, most recently in Energy and Environmental Science, in collaboration with Fikile Brushett, the Raymond A. and Helen E. St. Laurent Career Development Professor of Chemical Engineering at the Massachusetts Institute of Technology. In addition to teaching organic chemistry, which is part of Odom’s regular teaching assignment, Odom says that one of her favorite aspects of research is writing. “I like the challenge of putting together a concise story with just the right amount of information,” she said. Odom was also selected to participate in a National Science Foundation (NSF) I-Corps Teams Program this fall, which supports Odom as the principal investigator, her postdoc Aman Preet Kaur as the entrepreneurial lead, and James Landon as the industry mentor, to travel to educational workshops as well as conferences to conduct interviews to learn more about the energy storage market. Now an assistant professor, Odom has established a research group that works on some of the most challenging problems in energy storage research with a focus on solutions utilizing organic molecules. But she says the most gratifying part of her job is enabling her students to pursue their own careers in research.